The Locke children begin their difficult emotional journey in the first volume of “Locke & Key”. 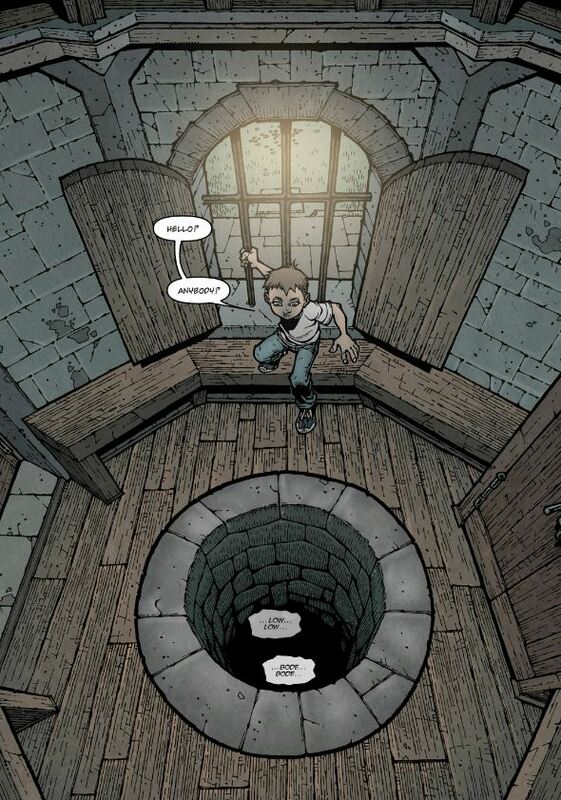 Terrible things happen between the covers of “Locke & Key: Welcome to Lovecraft”. A father is ruthlessly murdered, his wife is violated, a murderer leaves a trail of corpses behind him on his journey towards something better than the pathetic deck of cards he’s been dealt. Magical things occur in “Welcome to Lovecraft” as well. Ghosts in wells communicate with the living, paintings come to life, and mythical keys open doors to things which are fantastic or chilling; sometimes both. However, between the moments of horror and magic, writer Joe Hill imparts the most integral characteristic of his book: heart. “Welcome to Lovecraft” follows the lives of the Locke clan after the death of patriarch Rendell Locke by a former student, Sam Lesser. Rendell’s wife Nina is left to pick up the pieces of her family’s shattered existence by bringing her three children, Tyler, Kinsey and Bode, to her husband’s family home, Keyhouse. Located in Lovecraft, Massachusetts, Keyhouse is a centuries old estate inhabited by Rendell’s younger brother Duncan. Six-year old Bode comes across an unusual key while nosing around in the hidden corners of Keyhouse. Within moments, the youngest Locke uses the key to open a door that is the first of many wonders that will befall the child. The keys located in Keyhouse hold magical powers to whomever uses them; specifically children. Bode’s key turns the boy into a ghost once he crosses through the doorway, leaving his breathless carcass to lie silent as his spirit travels anywhere he imagines within the estate. Soon Bode is communicating with a spirit that exists on the property as Tyler and Kinsey try to work through their shattered existence. At the same time, an imprisoned Sam Lesser has grown even more determined to get to Keyhouse so that he may reap all the unimaginable gifts he believes reside in the mystical Locke home. Hill and artist Gabriel Rodriguez keep the story moving along until its heart-pounding conclusion, but the writer generously explores the Locke children and the book benefits greatly. “Welcome to Lovecraft” realistically confronts the unbearable pain of losing a loved one unexpectedly. Each of the Locke children struggle, not to make sense of what happened, but to pull their heads above water to survive. In the book’s third chapter Hill focuses on Kinsey Locke, a teenager whose main purpose becomes to disappear into the background. She doesn’t want to standout, doesn’t want to be noticed, and doesn’t want to make new friends. Not immediately anyway. After beating a girl named Jackie at track practice, Jackie asks Kinsey if they could run together sometime. Kinsey makes an excuse not to and bolts off. “We can’t run together because if we did,” Kinsey thinks to herself, “after we were done running, you’d want to talk, and you’d ask if I ran at my old school, and my old life is off limits.” It’s scenes like this where Hill’s dialogue stings with authenticity and we’re reminded that the pain of her father’s death remains immeasurable. In a brief passage near the end, Tyler contemplates suicide and we find that his wounds are as raw as his younger sister’s. “I’ve had enough but I don’t know what it would do to Bode if I stepped out the door,” wonders Tyler. “The little weirdo needs someone to tell him the important stuff. Like knock-knock jokes.” Internal dialogue such as this is where, however heavy the scene may be, Hill instills a lightness which keeps the work from becoming morose. Rodriguez fills his beautiful panels with painstaking detail. Rodriguez’s artwork is unconventional for comic books, but the artist has a strong knack for storytelling. A clever device he employs throughout “Welcome to Lovecraft” is the use of identical panels to intensify what is occurring in the story, whether it is an awkward silence, the passage of time, or a son trying to contemplate the enormity of his father’s death. In the opening chapter, Tyler sits alone with his hands clasped. This wide panel is repeated fourteen times, mostly with no words, as people come in and fail to comfort him on the day of his father’s funeral. 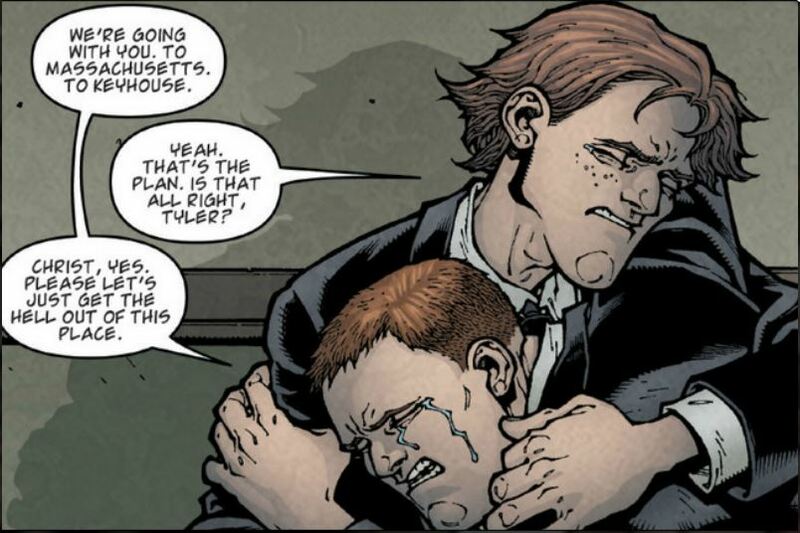 When the panel finally changes, the scene is that much more dramatic when Tyler finally grasps his uncle and cries in his arms. Although there is a similarity in his character work, Rodriguez instills distinctive traits in the relatively small cast of “Welcome to Lovecraft” to prevent them from being indistinguishable. The artist’s work is beautifully detailed, from the textures on the walls, to the trees in the background, to every piece of wood that makes up Keyhouse. Rodriguez is also up for fully realizing the graphic horror of Hill’s script, thus creating images that are near impossible to put out of your head. Jay Fotos’s muted palette captures the gloominess of Hill and Rodriguez’s story. The first volume of “Locke & Key” goes to some unthinkably sad places, but the characters at the center of the story keep the material from becoming unpleasant. This is the magic, the real magic, of “Welcome to Lovecraft”.